After a dramatic midweek of Premier League action, we rate each side's performances. 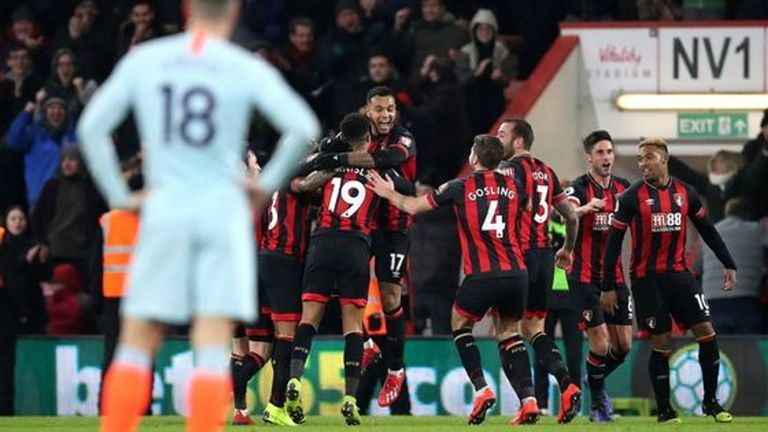 While Tuesday was a night of dramatic comebacks, Wednesday saw Liverpool fail to capitalise on Manchester City's defeat, and Chelsea suffer a worrying 4-0 defeat at Bournemouth. Who came top of the class, and who needs to do their homework as we go into February? Tuesday was, without doubt, Newcastle's best day of 2019 so far. First there was the news that the club were finally set to break their transfer record that's stood since 2005, then Newcastle produced an excellent display to beat Manchester City in the league for the first time since 2005. Since their 3-0 win at Stamford Bridge nearly a year ago, Bournemouth have lost their last 10 in a row against the so-called Big Six. They put that statistic to bed in emphatic fashion as Chelsea were torn to shreds in a breath-taking second half at a bouncing Vitality Stadium. This was Eddie Howe's 300th game of his second stint as boss, and he marked the occasion in style as a resolute defensive display was coupled with devastating counter-attacking football with David Brooks at the heart of everything. Highlights from Fulham's 4-2 win over Brighton in the Premier League. They've gone under the radar of late, but Burnley have enjoyed a drastic improvement this month. Sean Dyche managed to stay upbeat despite throwing away a two-goal lead with three minutes to go, because this was the Burnley of old. 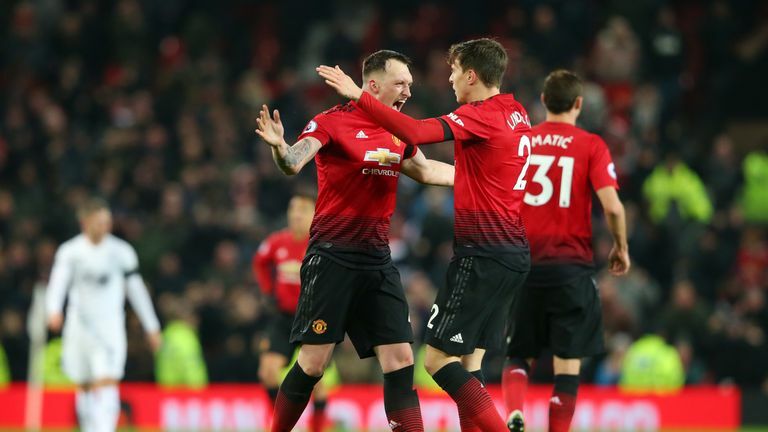 Industrious and disciplined, Burnley were fantastic in all thirds of the pitch, taking their chances and throwing bodies all over the box to deny United. James Tarkowski, Ben Mee and Charlie Taylor were superb, but Tom Heaton was Burnley's star performer with several fine saves. Are Burnley back to their old selves? Dyche certainly thinks so. (Gerard Brand). 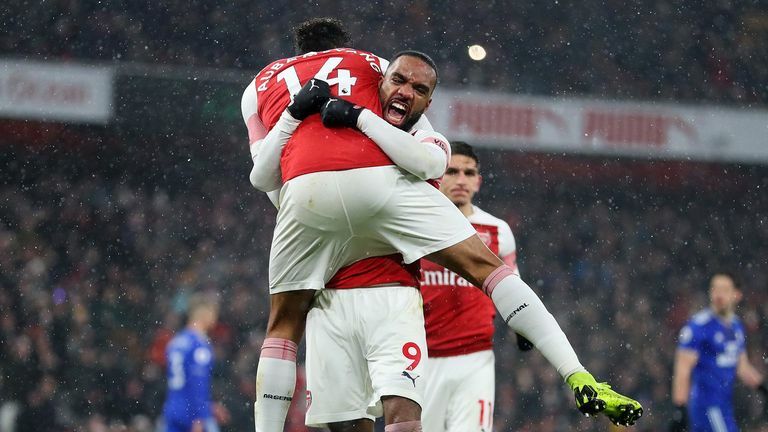 Cardiff would have been forgiven if the magnitude of the previous week's events had got the better of them at the Emirates. The tragic disappearance of the plane carrying striker Emiliano Sala and his pilot shook the footballing world, and by the time Cardiff's first game rolled around, football seemed immaterial. 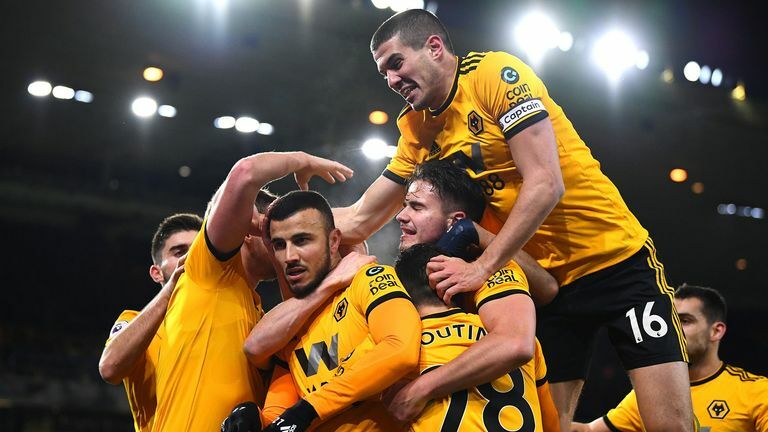 Wolves made hard work of victory over West Ham, which sounds odd considering the margin of victory. But for the first hour, it looked like it might be a frustrating night for the hosts, who had taken their time to get into the game but were fully in control once they had. Highlights from Wolves' 3-0 win over West Ham in the Premier League. It was billed as the night where Liverpool would take a giant leap towards a maiden Premier League title, but, in the end, it was more like a tentative step. The Reds move five points clear at the top with just 14 games to play, but it could have been much, much more for Jurgen Klopp's side. Sadio Mane got them off to a dream start but Leicester, with the help of adverse weather conditions, managed to contain the Reds before they ran amok. A cloud of anxiety descended on Anfield after Harry Maguire's equaliser and few chances fell Liverpool's way before the points were shared. Highlights from Liverpool's draw against Leicester in the Premier League. 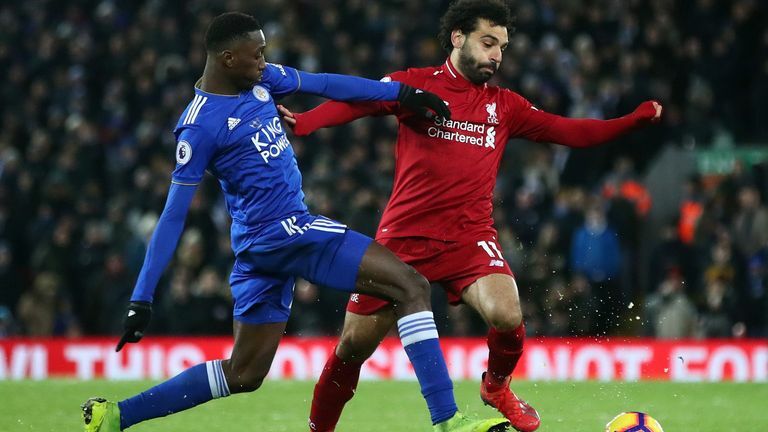 Leicester were on the ropes at Anfield with just two minutes and two seconds on the clock but fought back after Sadio Mane's opener to earn a credible point. Having dealt with the early setback, the Foxes steady growth in the game raised the anxiety levels at Anfield before Harry Maguire equalised on the stroke of half-time. 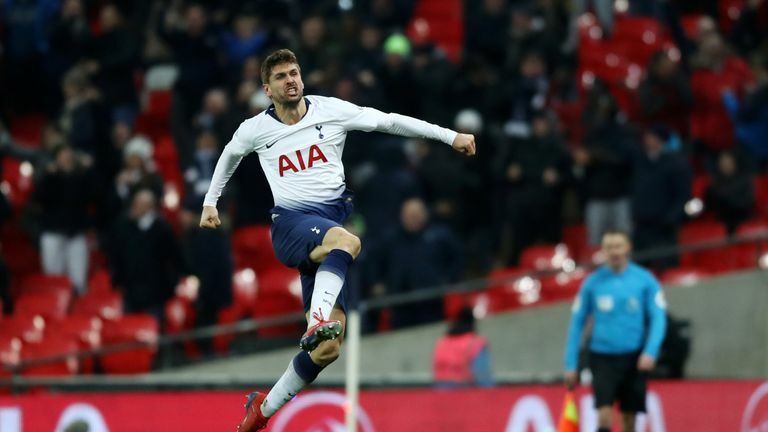 After a first-half performance barely worthy of a grade at all, Tottenham returned to their normal sevles by salvaging a late win. They looked full of the gloom of their last seven days before half-time, devoid of confidence, character or ideas, but once Lucas Moura was introduced at the break, it was a different story. Watford could not be faulted for their spirit and organisation at Tottenham, and were good value for their 1-0 lead at half-time. But when Spurs got out of first gear, it became more of a struggle and they did well to hold on as long as they did. In the end fatigue may well have told, as Watford had to do a huge amount of running to keep themselves organised as Spurs' tempo increased, but they can take plenty of heart in a season which continues to impress with Javi Gracia at the helm, and look forward to a reunion with pantomime villain Marco Silva on Saturday. An underwhelming performance from Arsenal on an emotional night at the Emirates, where football was put into perspective. The Gunners spent large parts of the first half keeping a spirited Cardiff side at bay. Mesut Ozil was ineffective, Pierre-Emerick Aubameyang and Alexandre Lacazette were isolated and it took a rash challenge from Bruno Manga to hand the hosts an opening. Highlights from Arsenal's 2-1 win over Cardiff in the Premier League. 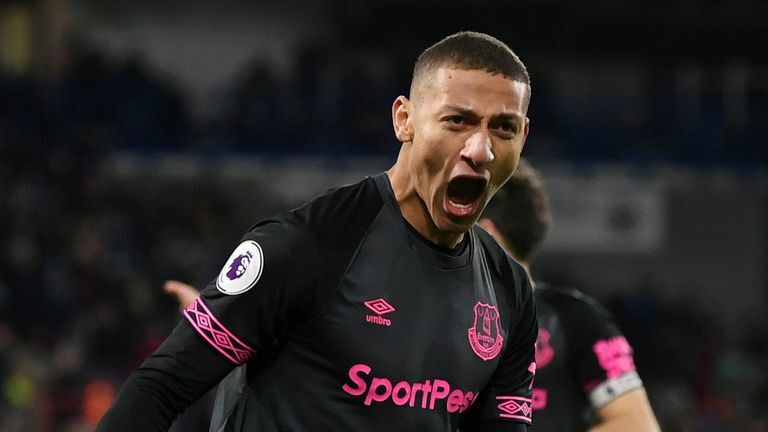 Everton went into their game with bottom side Huddersfield with the third-worst run in the division, collecting just eight points from their previous 10 games, but they showed great character to respond to their shock FA Cup exit to Millwall. Marco Silva made five changes to his side, and it was only after Lucas Digne's sending off that a Terriers team looking to impress their new head coach Jan Siewert caused any problems. With just one shot on target after the break, this was far from spectacular, as Silva admitted himself, but grinding out victories must become a trait of Everton after recent signs of a soft underbelly. The size of the task facing Jan Siewert was made clear in 90 minutes that encapsulated Huddersfield's season. The Terriers suffered a 1-0 defeat at home to Everton, a ninth time this campaign that they have lost by the odd goal. Highlights from Everton's 1-0 win over Huddersfield in the Premier League. It means they equalled a record for fewest top-flight goals after 13 home games - five, level with Arsenal in 1912/13. They only have 13 overall in their 24 league games, and here they only tested Jordan Pickford after Lucas Digne's sending off with 24 minutes remaining. Ralph Hasenhuttl has installed a backbone in this Southampton team and they may well have rolled over in this type of game earlier in the season under Mark Hughes. 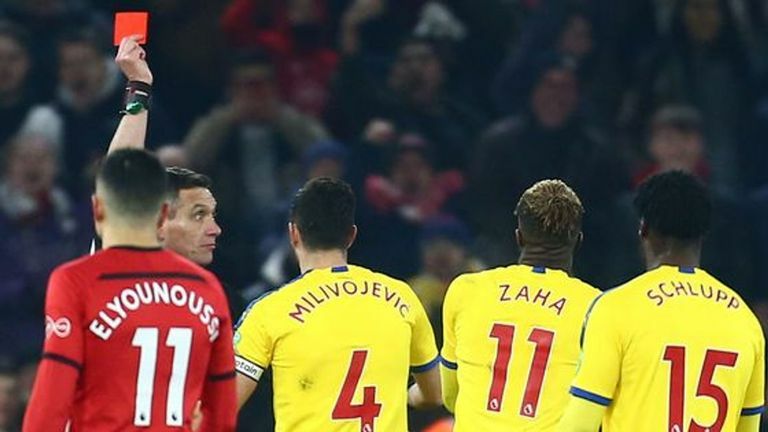 However, while that resolve was enough against Crystal Palace, they will need to show more quality between now and the end of the season to cement their Premier League status. Highlights from Southampton's win over Crystal Palace in the Premier League. The Eagles have certainly turned the corner after two straight league defeats and Roy Hodgson will have seen enough at St Mary's to convince him his side can beat the drop. Wilfried Zaha's lack of self-control was a reflection of Palace's frustration at losing their lead, which they should have built on. For the first time under Ole Gunnar Solskjaer, the intensity in the first 20 minutes was not there for United. It's a testament to Burnley's defence, who forced United wide and piled the central areas, but this was a frustrating night for the hosts. Marcus Rashford, Romelu Lukaku and Paul Pogba were crowded out at every opportunity, though if Rashford had tucked away a simple early chance. Highlights from Manchester United's draw against Burnley in the Premier League. West Ham were utterly ineffective and dispiritingly dull as they went through the motions en route to a 3-0 defeat at Wolves. After eight wins in a row and 29 goals scored without reply, City were oddly lacklustre against Newcastle as they missed the chance to put some pressure on Premier League title rivals Liverpool. Aguero's early goal looked to have given City the perfect start, but they rarely looked like extending their advantage. It was a performance that was reminiscent of City's first-half display against Lyon earlier in the season; lacking in intensity and featuring an uncharacteristic amount of errors. Maurizio Sarri questioned whether he is the man to motivate this Chelsea squad, and the manner in which his side collapsed in the second half on the south coast will greatly concern the Italian as he looks to secure a top-four finish. Bournemouth rode their luck at times, by Eddie Howe's own admission, with Artur Boruc producing a fine save to deny Mateo Kovacic an early opener, but this was a night of no positives as Eden Hazard and Gonzalo Higuain played like strangers in their first appearance together.